#1 Why You Should Buy a Stun Gun? Although there is a lot of controversy that surrounds owning and using a stun gun, a stun gun can be extremely helpful. 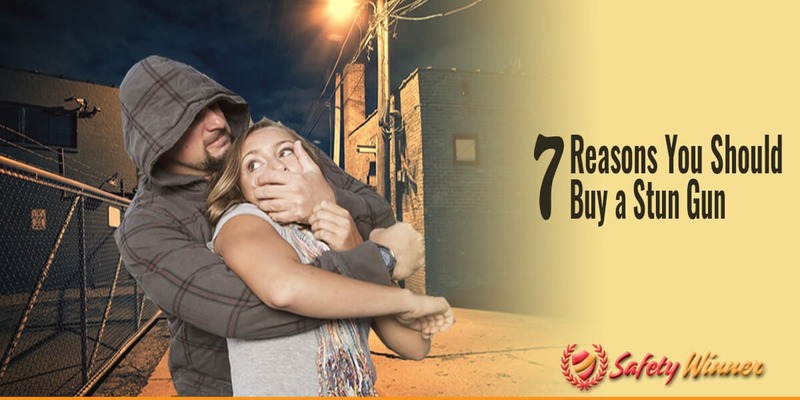 Keeping that in mind, here are seven reasons why you should buy a stun gun! When an attacker attempts to harm someone, they usually think that they have the upper hand in the situation and the most control. This is because attackers are usually physically fit and might even have some type of weapon. But, when you have a stun gun, you automatically take control of the situation and determine the outcome. In other words, you take all the power away from your attacker. All of a sudden you could turn a potentially life-threatening situation into a controlled or even missed situation all by pulling out your stun gun. Another great aspect of stun guns is the fact that they are compact. This makes it extremely easy to store and carry your stun gun anywhere and everywhere. Common places to store stun guns include in your purse, in your car, or on yourself. If you decide to carry your stun gun in your purse, you should slip it in a pocket or place it towards the top of your purse. Likewise, if you store your stun gun in your car, it should be in your center or side console or compartments. You should store your stun gun in one of these accessible places because you want to be able to grab your stun gun as quickly as possible in the event that you need to use it. Finally, the best place to store your stun gun is on yourself. Many stun guns are so compact that you could easily slip it into your pocket. Otherwise, many stun guns come with belt loops. So, you can easily secure your stun gun to your pants. Stun guns are usually discreet, which mean that your attacker might be taken by surprise when you pull your stun gun out. This could help the situation in one of two ways. Either your attacker will be so shocked that you actually have a useful and detrimental self-defense item that they will leave you alone, or they will be so shocked that when you administer the stun gun, they will be ultra-sensitive and feel the shock a ton. In other words, the stun gun shock will most likely send them to the ground and debilitate them for approximately thirty minutes. This will give you the perfect amount of time to run to safety and seek help. Despite popular belief, stun guns are extremely easy to use. Seriously, all it takes is a quick switch or click of a button, a strong grasp, and the ability to get close to your attacker and press the stun gun into their body to administer a good stun gun shock that will send them to the ground. Although this might seem like a long process, in reality it only takes a few seconds to administer a stun gun shock on an attacker. Stun guns are so easy to use that virtually anyone can use them. Ultimately, they are one of the easiest self-defense items to use and carry. Stun guns are extremely easy to maintain because they require virtually no maintenance. This is unlike other self-defense items, such as a pocket knife or a regular gun. With a stun gun, all you have to do is make sure it is properly charged. This means that you should charge your stun gun once a week or replace its batteries at least once a month. Of course, if you use your stun gun often, then you should recharge it more often. It’s also a good idea to replace your stun gun at least once every few years, even if you rarely use your stun gun. This is because the stun gun industry is consistently changing and evolving. So, the stun gun you purchased a few years ago might already be seriously outdated. In other words, you might be able to purchase a newer stun gun that is more discreet, safe, and powerful. One of the best things about stun guns is that they are easy to purchase. Stun guns are not considered weapons. Therefore, you don’t have to get a background check, register your stun gun, or go through any special training to own and use a stun gun. Instead, you can simply go in a store or browse online to purchase as stun gun. Of course, you won’t be able to do this if stun guns are illegal in your area. Yup, that’s right: you won’t even be able to purchase a stun gun online if they are illegal to own in your area. So, unless you live in a place where stun guns are illegal, stun guns are extremely easy to access and obtain, which make them the most practical self-defense item. Overall, owning a stun gun is the perfect plan A. Just take a second and think about it. If you own a stun gun, you never have to worry about being defenseless. After all, in the event that someone intimidating approaches you, you can easily pull out your stun gun and either scare them or shock them (both figuratively and literally). Ultimately, owning a stun gun is the perfect way to ensure maximum safety. I can’t count how many times I’ve been nervous or paranoid in a situation and have pulled out my stun gun just to be safe. Luckily, I’ve never had to administer my stun gun. But, it was comforting to know that I had a secure grip on my stun gun and I could administer it at any second if I needed to. After all, you never know when something scary and unexpected could happen. That being said, it’s better to be safe and prepared with a plan A than to be panicked and sorry.